This is the Everton Football Shirts and Accessories shop at the Soccer Box online store. Here you will find a fantastic selection of merchandise and accessories to help you show your pride and support for the Everton football team. Everton football club is based in Liverpool and was established in 1878. Everton has consistently played in the top-flight of English football and in recent seasons has finished in the top half of the Premier League table. The teams continued success has ensured a large fan base that are keen to show their support with team accessories and merchandise. The team’s fans are primarily located in the North West of England, however, supporters can be found around the world. Football supporters are keen to show their support for their team in any way possible. At Soccer Box you can shop for a fantastic selection of Everton football accessories and merchandise that is ideal for every day use to show your team allegiance. Today Everton fans will think of the famous royal blue color of the Everton football shirts. The blue shirts have been worn since 1900, however, prior to this indecision ruled and several different colored kits were trialled. Initially blue and white striped shirts were worn. This then changed to black that was considered dull so a red sash across the front of the shirts was introduced. Still not satisfied, several alternative colored shirts, including pink and blue striped shirts, were trialled before settling on today’s infamous royal blue color scheme. Supporters of Everton football club adorn themselves in the blue shirts and football accessories on match day to show their support for the squad. Goodison Park is the clubs home stadium; the stands are filled with fans sporting their Everton football shirts and merchandise on match day. 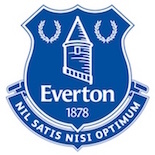 The Everton football merchandise and accessories sold by Soccer Box utilize the famous blue color scheme and the Everton crest to ensure support for the team is prominent. There is Everton football accessories and merchandise suitable for any fan to use at the match, at home, school or the office. All merchandise available at Soccer Box is fully licensed by the club. Traditional football merchandise includes scarves, hats and mugs; these are all available in the Everton football accessories store, along with a selection of less traditional merchandise. If you are looking for a novelty gift or souvenir the Everton football shirts and accessories store is the place to look. Whether you are looking for kids or an adult you are sure to find a suitable gift or souvenir from the selection of merchandise available. Young fans of Everton football club may love to have their bedroom decorated with Everton merchandise and accessories. An Everton quilt cover would brighten up any room along with accessories such as a cushion or wall clock. Your youth is also sure to love merchandise that is perfect for use at school, such as a backpack or lunch bag. Everton football shirts and accessories are a great choice for any fan of Everton football club. Browse the rest of our store where you will find shirts, accessories and merchandise for Premier League, international and national teams. Shop for Everton football shirts and accessories at Soccer Box with fast UK and international shipping options!